Curved features on Jupiter’s moon Europa may indicate that its poles have wandered by almost 90°, a new study reports. Researchers believe the drastic shift in Europa’s rotational axis was likely a result of the build-up of thick ice at the poles In full on Universe Today. 1978: Peter Warlow, "Geomagnetic reversals? ", J. Phys. A: Math. Gen. 11 2107-2130, who suggests "The motion is classed as a fast precession, or nutation [..] the motion of a tippe top"
Last edited by nick c on Fri Mar 25, 2011 10:55 am, edited 1 time in total. Re: Pole Shift on Europa? Basically their stuff is based on Hapgood crustal displacement theory. Not the best orgainsed site on the web and it's loading very slowly at the minute. They do this all the time -- release information as "new" when its been discussed for seven years. Frankly, its my opnion that Europa isn't ice at all, its probably silicon and oxygen and iron, etc. just like the other moons. 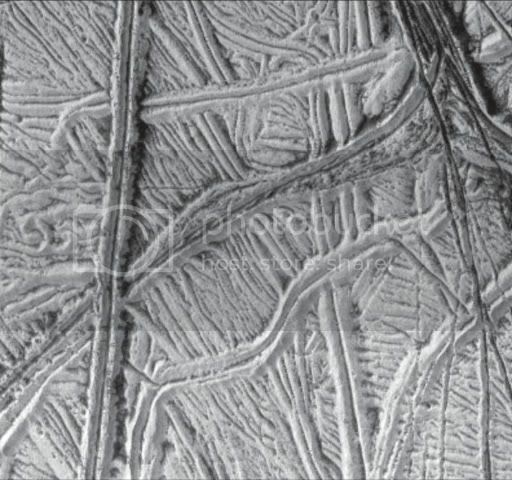 It may have a thin coating of ice, but those "cracks" in its surface are EDM artifacts. The same problems we encounter with cosmological theories are found in planetary geology. Exploration of the outer solar system has led to studies in a new area of physics: electronically induced sputtering of low-temperature, condensed-gas solids (ices). Many of the icy bodies in the outer solar system were found to be bombarded by relatively intense fluxes of ions and electrons, causing both changes in their optical reflectance and ejection (sputtering) of molecules from their surfaces. The small cohesive energies of the condensed-gas solids afford relatively large sputtering rates from the electronic excitations produced in the solid by fast ions and electrons. Such sputtering produces an ambient gas about an icy body, often the source of the local plasma. This colloquium outlines the physics of the sputtering of ices and its relevance to several outer-solar-system phenomena: the sputter-produced plasma trapped in Saturn's magnetosphere; the O2 atmosphere on Europa; and optical absorption features such as SO2 in the surface of Europa and O2 and, possibly, O3 in the surface of Ganymede. The illusion from which we are seeking to extricate ourselves is not that constituted by the realm of space and time, but that which comes from failing to know that realm from the standpoint of a higher vision. -L.H. An exciting period of exploration of the outer solar system is underway by spacecraft, by remarkably improved ground-based observations and by orbiting telescopes: International Ultraviolet Explorer (IUE) and Hubble Space Telescope (HST). These studies have revolutionized our understanding of the solar system revealing a kaleidoscope of unusual worlds. Because of the low surface temperatures, typically < 130K, ice is the 'rock' in the outer solar system. That is, excluding the four giant planets and Io, it is the structural and thermal properties of ice that determines the surface geology of many objects from the orbit of Jupiter outward (Burns and Matthews, 1986). Therefore, understanding the radiation chemistry of and desorption from ice or low-temperature hydrated minerals is critical. Other more volatile molecular species, such as N2, O2, CO, CO2, NH3, CH4, and SO2 form atmospheres and polar 'ices' or can cause the surface to be geologically active. Io, a moon of Jupiter, is an exception. Owing to its tidal interaction with Jupiter, Io is volcanically active and has lost its water and other light volatiles. Because of this, frozen SO2, a volcanic gas on earth, covers Io's surface (Burns and Matthews, 1986). Since most small, outer solar system bodies, with the exception of Titan, have either no atmospheres or tenuous ones, their icy surfaces are exposed to the solar UV and to the local plasma causing desorption as well as physical and chemical alterations (Johnson, 1990; 1998). During the Voyager I tour of the outer solar system, W.L. Brown, L.J. Lanzerotti and colleagues at AT&T Bell Labs measured the ejection of molecules induced by energetic ion impact of ice. They discovered that the sputtering from low-temperature ices by fast, light ions is determined by the electronic excitations produced in the ice, rather than by knock-on collisions (Brown et al., 1978) and, hence, is an electronically-stimulated-desorption process. This exciting discovery opened a new field of study. Below the relevance of desorption to a few outer solar system bodies is described; for extended descriptions see Johnson (1990; 1996; 1998). Following the discovery that icy objects in the outer solar system are often exposed to a flux of ions and electrons, measurements showed that desorption is driven in ices and other materials by the electronic energy deposited and the desorption yields are large. This data has been applied to describe a toroidal 'atmosphere' and the source of plasma in the Saturnian magnetosphere (Richardson, 1998; Jurac and Johnson, 1999). Based on laboratory measurements that showed that irradiation of a low temperature ice directly produced O2 (Brown et al 1982), the ice-covered moon Europa was predicted to have an extremely tenuous O2 'atmosphere' (Johnson et al. 1982). Further, the neighboring moon, Ganymede, appears to have O2 and O3 formed and trapped in the radiation-produced defects and voids in its surface (Calvin et al., 1996). Since the dominant sputtering agents at Europa are the 100's of keV to MeV O and S ions (Fig.1), the sputtering yields for ice at ~ 100K are large ( ~ 100-1000 H2O/ion; Johnson 1990; Shi et al. 1995). Therefore, trace molecules contained in the ice, such as large organic molecules, may be carried off with the ejecta. Further, other more refractory surface materials, such as the proposed hydrated salts, would also experience decomposition (Johnson et al. 1998), initially losing their water of hydration (Williams, 1998). Therefore, desorbed species other than O2 are present in its atmosphere and ionosphere. In order to determine the surface composition of these interesting bodies, and the possible presence of pre-biotic materials, an intense laboratory program is needed to compliment the spacecraft and HST observations. The Galileo spacecraft is orbiting Jupiter at present and the Cassini spacecraft will soon arrive at Saturn, a probe will be sent to Europa, and the Rossetta mission will put instruments on a comet early in the next century. Therefore, laboratory studies are needed to interpret the expected wealth of data. illuminates the surface from the upper left. Courtesy of NASA/JPL. moon Europa. 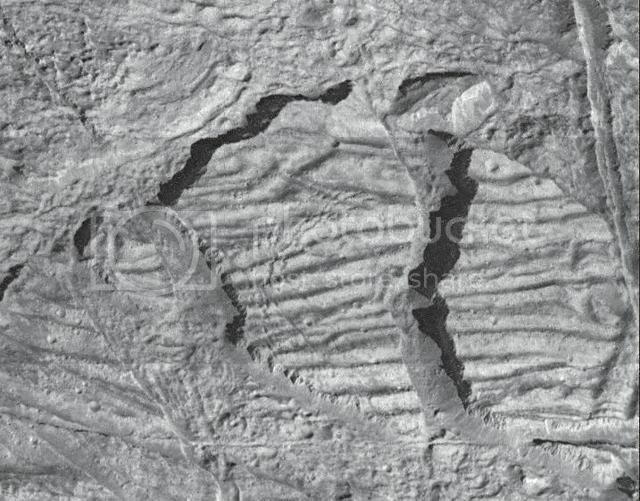 It shows an area where icy plates have been broken apart and moved around laterally in a hummocky matrix. SYDNEY: The globe-spanning ocean on Jupiter’s moon Europa contains about twice the liquid water of all Earth’s oceans combined, says a new study, which finds it’s packed with oxygen which could support life. These guys have got some very active imaginations... already speculating on the amount of marine biology that could be supported by those "vast liquid oceans" under all that ice! For a different perspective on what happened on Europa, and it's physical characteristics, may I suggest the TPOD Archives> by subject> under Moons> articles regarding Europa. What is missing in that article is "what, exactly, causes the production of oxygen in the first place", and then maybe they should look at a transport mechanism likely to get it down though perhaps kilometers of ice to the hypothesized water. To this end, researchers sought to estimate the level of oxygen reaching the ocean. To find out more, experts led by Greenberg considered the age of the moon’s surface. Its geology and a lack of impact craters, suggests that the ice is continually reformed in an active process and the current surface maybe no more than 50 million years old, just a fraction of the age of the Moon. The experts considered three generic resurfacing processes: the gradual layering of fresh material on the surface; cracks which are filled with fresh ice from below; and patches of ice that are disrupted and replaced with fresh material. Using estimates for the production of oxygen at the surface, Greenberg found that the delivery rate into the ocean is so fast that the oxygen concentration could exceed that of the Earth’s oceans in only a few million years. The continual supply of oxygen could support roughly 3 billion kilograms of 'macrofauna', the research suggests - assuming similar oxygen demands to terrestrial fish. The disconnect is his going from examining theories of how new ice is formed to "therefore oxygen production at the surface does thus and such". No wonder this scientist merely suggested that the ocean may be highly oxygenated. The article, anyway, fails to describe how that oxygen is created in the first place! New ice, maybe. Ice production by itself doesn't create oxygen or else our refrigerators' ice makers might be a source of an explosion when we open the door and the light comes on! I could have attended that conference and showed ways that new ice could be being made and all that and then suggested in the next breath, "Using estimates for the production rate of sodium at the surface based on the surprising amount seen in the plume ejecta, we estimated that within a few million years the ocean would have achieved a salinity 7 to 8 times that of Earth's oceans." My suggestion, using precisely the same non sequitur as his, should be equally valid. --Maybe better; who knows? That's the big question here, for the conferees: who the #@* knows? If he had said that ionization from a source of radiation or from the solar wind is stripping the H from the H2O, or maybe Eskimos with refrigerator-freezers that can't be resolved by Cassini, maybe he'd be going somewhere, and we'd have some silly thing to think critically about, but he doesn't go there. Europa is not ice covered. I think that Europa is actually a ball of metal and the orange/red color is iron dust. The cracks are discharge paths over this very conductive surface. It looks like a ball of Iron that has no way of oxidizing... What ever it is I don't believe it is an ice covered sphere. What do you think? Electricity = Magnetism x Speed of Light Squared... Thats what he really meant. Re: Europa is not ice covered. What evidence prompted you to think that? Just curious because other materials (organics, phosphorus compounds, some paint pigments like red lead, etc.) can be a similar shade of dark brownish red, too, so it's possibly pretty speculative unless you or NASA have some spectrographic evidence that sunlight is being reflected from iron oxide deposits on the surface. The white parts look fairly white in photos from a closer perspective and better resolution, often interpreted as an ice (water and CO2 for two examples observed on Mars). I'm not saying it's not iron oxide, although the entire rusty metal ball concept seems a little bit of a stretch for this skeptic. You are right it is complete speculation and it may not be iron. Are there other moons with ice near Europa? where did the water come from? It just makes me wonder if they are right about the ice... I would imagine that a lot of people agree that it is ice? I don't know.